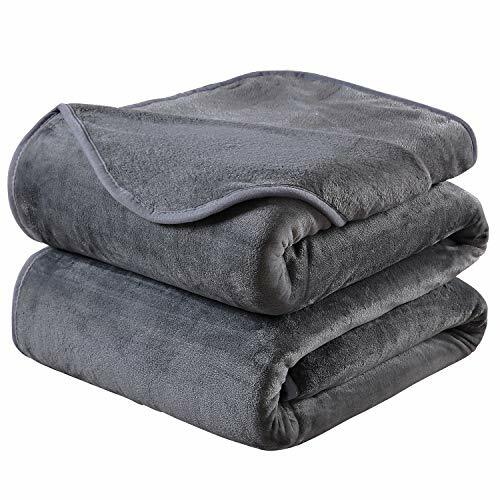 HOZY Soft Blanket King Size Fleece Warm Fuzzy Throw Blankets for The Bed Sofa Lightweight 350GSM Dark Grey 90" 108"
HOZY blankets ensure you the impeccable sleeping feeling at a reasonable price. It perfectly matches to any situations, sleeping, camping, traveling, in car, backpacking and traveling and for baby. Lightweight design makes it easy to store and to carry wherever you want to go. Qualified technology and materialWith a reasonable price, 350GSM, no sheding, no fading, breathable and comfortable.Double needle sided exquisite stitching and great material promise you the most softest feeling with great benefits to your health. Different choices for you.Nine color choices: Ivory, Green, Grey, Sky Blue, Royal Blue, Chocolates, Dark Grey, Camel, Purple. Four size choices: Travel 50*61inches, Twin 66*90inches, Queen 90*90inches, King 90*108inches. All year-round use Our blanket can work for all seasons,winter, summer, spring and autumn. Easy care, better life. Machine washable, wash on low heat and air dry. Do never use bleach or directly high heat. Easy to care but more durable. Satisfied service and guarantee to you.100% guarantee to refund and return the item in case you don't like it and provide satisfied customer service to you. It takes you and your family the perfect sleep feeling and the benefits to health, hypoallergenic, no-shedding, no-fading, all benefits can be got after this purchase. The qualified customer service ensure your purchase experience satisfied. " Qualified technology and quality. Double needle sided stitching and great material promise you the most softest feeling with great benefits to your health. Hypoallergenic, warm, super soft, cozy, lightweight and no shed, no fade, reversible design and durable. Suitable for lots of situations: sleeping, sofa, camping, in car, backpacking and traveling. The lightweight feature ensures the facility to carry and to store. Great to all seasons: winter, summer, spring and autumns. Mashine Washable, easy care. Wash on low heat and air dry.Do not wash with dark color texture and never use bleach. Guarantee to you. 100% guarantee to refund and return the item in case you don't like it and provide satisfied customer service to you. If you have any questions about this product by HOZY, contact us by completing and submitting the form below. If you are looking for a specif part number, please include it with your message.